All titles composed by Julio Botti. El Cirko sello digital is proud to present “influences” the third CD of Argentine saxophonist and his new group “Julio Botti & The South America Jazz Project”, this project contains the collaboration of three young musicians , pianist and keyboardist : Eduardo Withrington (Cordoba, Arg) Drums:Tiago Michelin(Uruguay/Brasil) and guitar: Andrew Beard (Texas USA). After two collaborations with Maestro Pablo Ziegler who went Nominadas to the Latin Grammy as best album of tango 2013 “Tango nostalgia” and 2016 “Sax to Tango”. Botti has taken a break for the Tango Nuevo and resumed his love for the South American rhythms and modern jazz recorded nine compositions of his own. Sax to tango nominated for Best Tango Album in the 17th Annual Latin Grammy Awards. ZOHO Music is honored and proud to showcase Sax To Tango, the second CD collaboration between Argentine born, but New York domiciled saxophonist Julio Botti and his celebrated mentor and colleague, Nuevo Tango pianist, arranger and composer Pablo Ziegler. Their first collaboration “Tango Nostalgias” (ZOHO ZM 201207) featured two classic quintet settings, recorded in Buenos Aires and New York, respectively, with an occasional string quartet accompaniment. It achieved a Latin Grammy nomination in the “Best Tango Album” category in 2013. Their new project, Sax To Tango, is far more ambitious in the scope of its arrangements and orchestration. It features The University of Southern Denmark Symphony Orchestra under the baton of Argentine conductor Saul Zaks in a selection of nine iconic Astor Piazzolla nuevo tangos, one Tango standard, and three compositions by Pablo Ziegler. The recording sessions for this album were scheduled in connection with a live concert of this material on June 9 and 10, 2015. Zafari Project originates in Madrid in the year 2003, made up by four young musicians with the spirit of presenting a new proposal united by a common language. They are a new group with big expectations of transmitting YOUNG JAZZ in a city where it’s not easy to accept a new music scene, and introduces a repertoire based on their own songs and classics with a Madrilenian touch. Marta, Julio, Francisco and Acier, each one with a great musical talent gives the group old and new experiences that they have obtained by their devoted dedication to jazz. One of the biggest motivations that they have was having lived in New York, emphasizing in the compositions of the band the avant-garde of jazz of that city. With a lot of effort and dedication to this project Zafari has had an outstanding performance in the city of Madrid and surrounding areas. So many hours of rehearsals and hard work allowed Zafari Project to participate in “Injuve Iviza” in 2004. Zafari Project makes reference to a New Adventure, a new trip of jazz that is encountered day by day by the young musicians, playing new styles with irregular metrics and stylistic concepts that are not common in the Madrilenian jazz. 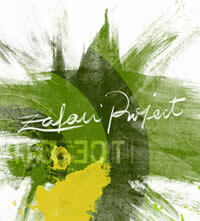 ZAFARI PROJECT A YOUNG PROPOSAL.